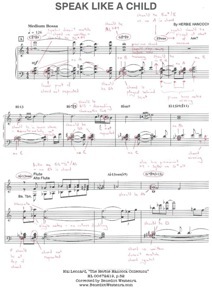 Two examples of transcribing/arranging work I did for Béyonce and Paloma Faith. It's probably easiest to show what good transcribing is by giving an example of how not to do it. Below are my corrections to a page of Hal Leonard's "The Herbie Hancock Collection", HL 00672419, from the publisher's "Artist Transcriptions" series. The series is supposed to be the most accurate collection of notated jazz available, and the book claims to feature Herbie Hancock's solos "note-for-note". 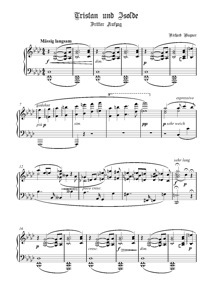 If I transcribe a piece I can guarantee I get every note, and understand where each note fits in the music's structure. This is my arrangement of the Prelude to Act III of Wagner's Tristan and Isolde. My methodology was to transcribe the music from a recording first, and then to check my arrangement with a score. This way I was able to make a much better approximation of the sound of the orchestral original than a note-for-note transcription would have produced.